To celebrate the introduction of the Emission Trading Scheme (ETS*) in New Zealand today (1 July 2010), I thought I’d publish the following article on what I’m doing in terms of residential Power Monitoring. 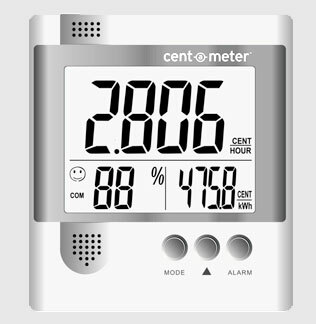 A few years ago, I was working on what devices would sit in an ‘average’ connected home and, given the sheer volume of ‘things’ â€“ it be came clear that not only would a homeowner need to justify the existence of each device, but also their unseen costs in terms of installation, maintenance and ongoing power usage. To answer the last of these, I bought a device called a Centameter which, aside from the benefit of being designed in NZ, measured the current power usage via an induction clamp and transmitter which sits in the power meter box and sends the data through to a LCD display. After a couple of attempts to elicit a response from the manufacturer, I asked an electrical engineering friend of mine to see what information they could pull from the display unit as we wanted to capture and graph this data over time. The short story is, while we could get some information out of the device, the time required to make this meaningful far exceeded what he was able to donate to the project so things were shelved â€“ until now.